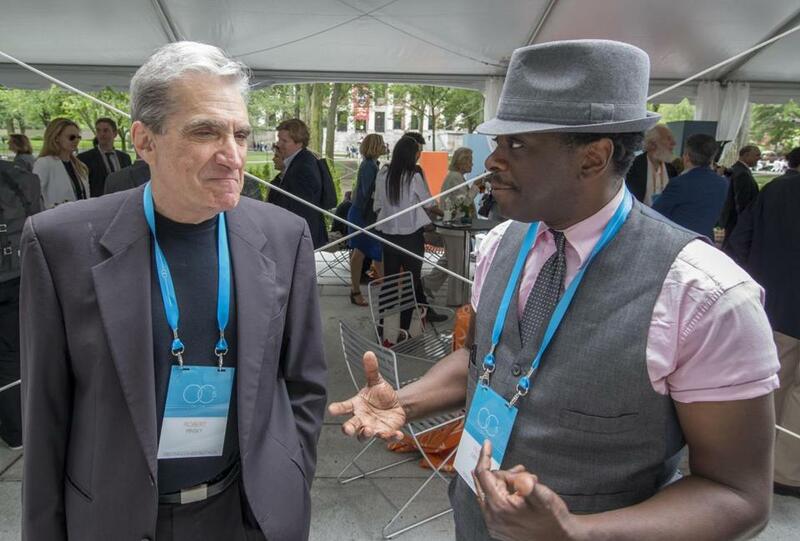 Robert Pinsky (left) and Regie Gibson at the On Cue gathering Tuesday in Cambridge. Poet Robert Pinsky, former “Tonight Show” bandleader Kevin Eubanks, and songwriter-author and former National Poetry Slam champ Regie Gibson were just a few of the participants at On Cue, a private gathering organized this week by the Boston-based venture capital firm Cue Ball. More than 300 people from the fields of entrepreneurship, technology, arts, and design took part. This year’s event honored the work of Neri Oxman, the Israeli designer-architect who teaches at the MIT Media Lab and is known for her work in environmental design.